Which trips are shifting modes in Melbourne? We know there has been a strong shift to public transport in Australian cities, but which trips are changing modes? I thought it worth examining Melbourne journey-to-work data from the ABS census for years 2001 and 2006 to look for patterns. 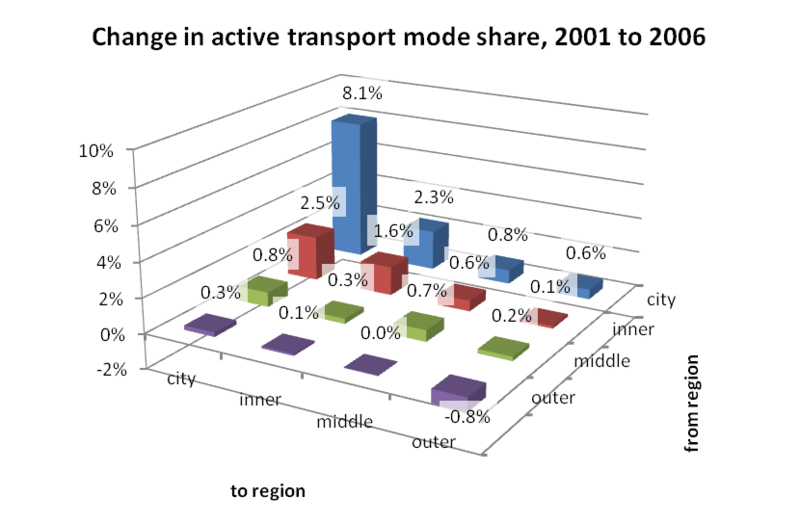 Although much of the recent mode shift has occurred post 2006, this analysis still provides insights into the earlier mode shift that started in Melbourne around 2004. I’ve specifically looked at trips with and between concentric rings of Melbourne, to keep the analysis relatively simple. Note that journeys to work only represent around 27-30% of weekday trips in Melbourne (depending whether you measure trips or trip legs), so this isn’t a complete look at travel. However, the census does provide an extremely comprehensive dataset as pretty much the entire population was captured. This isn’t a short post, so grab a cuppa. The second last chart is possibly the most interesting. And apologies that not all charts are easy to read as I haven’t quite mastered the best way to import charts into WordPress. Click on charts to see a larger cleaner version. (Note: these region definitions are quite different to those used in another post on urban sprawl and consolidation which had larger “inner” and “middle” regions). Melbourne’s trams generally service the inner city and inner suburbs, while buses mostly service the inner, middle and outer suburbs. The metropolitan train network is shown in blue. Note: this post looks at journeys to work between these rings, and not journeys that start or finish outside the Melbourne Statistical District. I don’t see this as an issue as I’m not trying to represent total Melbourne mode shares. The journey to work data includes 1.25 million trips, 115,890 from the “city”, 191,556 from the “inner”, 442,282 from the “middle” and 498,595 from the “outer”. There has been a significant growth in trips from the outer suburbs (in line with population growth). The largest movements are within the middle and outer suburbs, and to the city and inner suburbs. 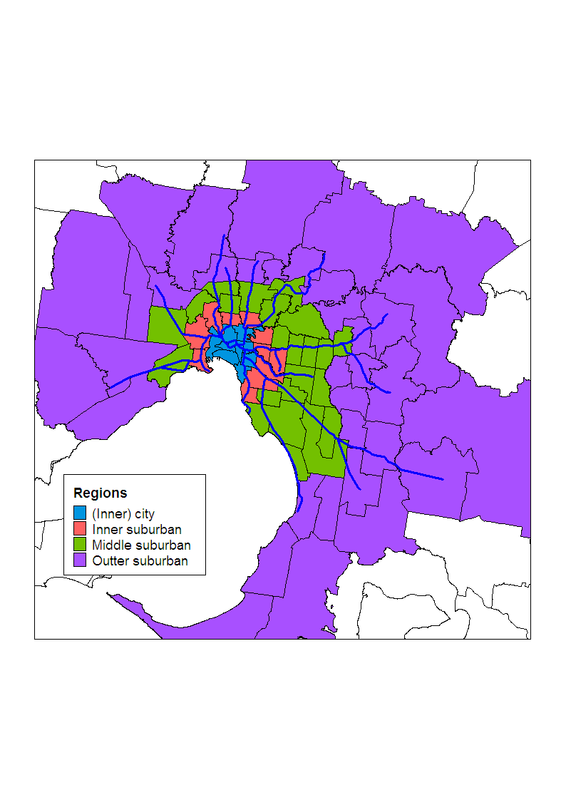 People in the middle and outer suburbs are more likely to work in the inner city than the inner suburbs. Perhaps because it is easier to get to the inner city. The middle suburbs are the biggest source of inner city workers (33%). Little wonder the trains are under stress. Few people in the inner city and suburbs commute to the middle and outer suburbs, but there has been an increase in the number of people in the middle suburbs commuting to the outer suburbs. 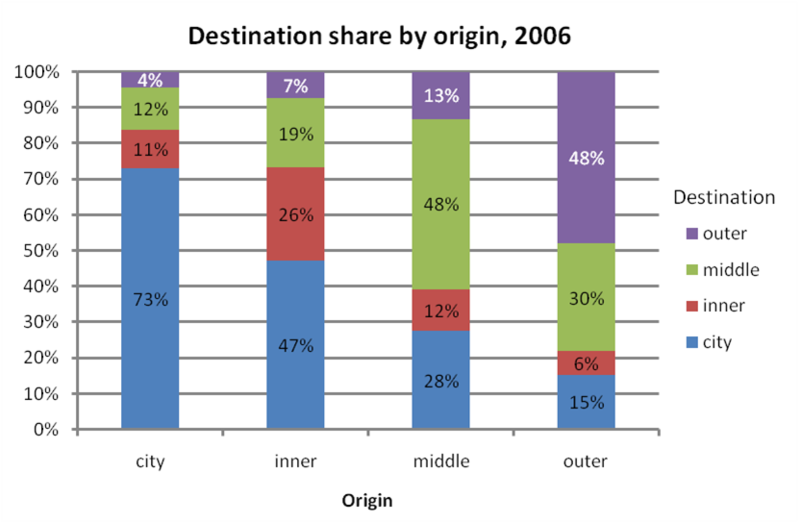 Public transport has a high mode share for trips to the inner city, but less so for people coming from the outer suburbs. 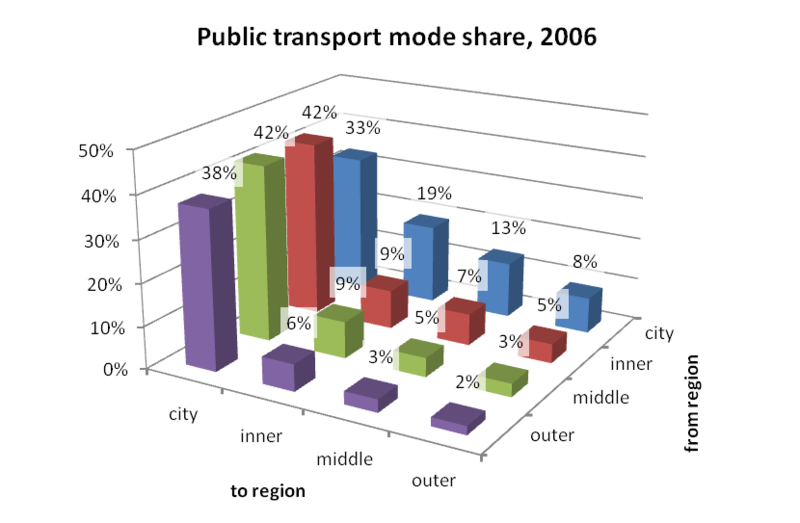 Other evidence I have seen shows consistently high public transport mode share for trips to the CBD and surrounds, so this would probably suggest lower public transport mode share to the inner city outside vicinity of the CBD (remember from the above that “inner city” includes several local government areas). 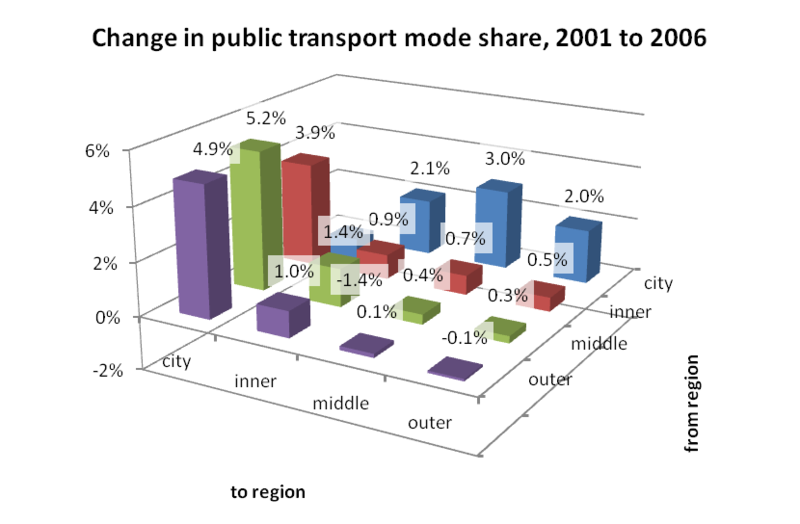 Public transport mode share is higher for origins and destinations closer to the city centre, where service levels are more attractive than the middle and outer suburbs. 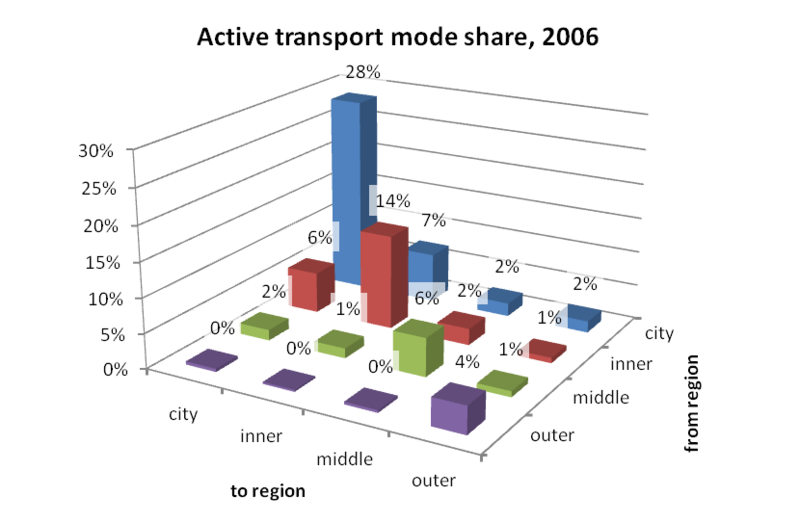 Public transport mode share for trips wholly within the middle and outer suburbs is very low. This presents challenges for the new Central Activities Districts, which will need higher quality public transport to avoid heavy car dependence. The biggest shifts have occurred for trips to the inner city from the suburbs. The next biggest mode shifts have been for outward trips from the inner city to the suburbs – although these are small in number. Following that there have been small mode shifts to public transport for trips to the inner suburbs. 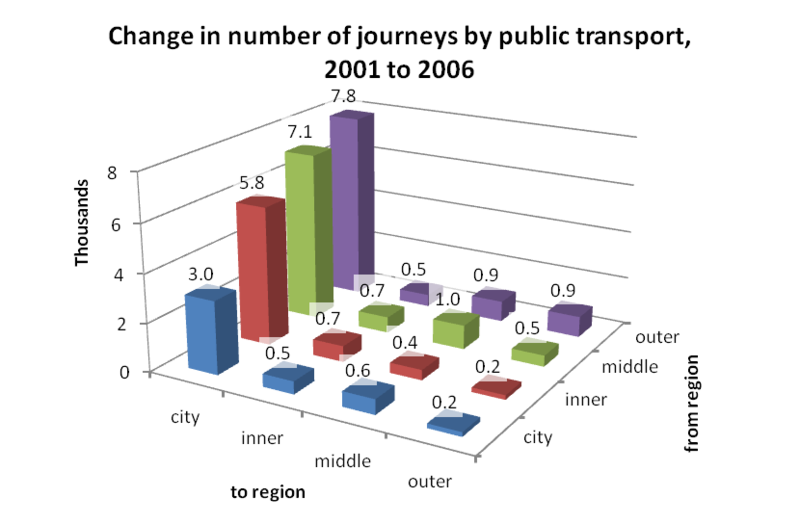 The figures actually suggest a 1.4% decline in public transport mode share for trips wholly within the inner city, even though there were around 3000 more such journeys in 2006. More on this follows below. There was very little mode shift for journeys within the middle and outer suburbs, where public transport service levels are relatively low. The chart shows significant growth in public transport trips to the inner city, particularly from the suburbs. The following charts look at the increase in journeys involving each mode of public transport. The biggest growth in train journeys has been from the outer suburbs to the inner city, followed by the middle and inner suburbs. This is consistent with evidence in another post that suggests train patronage is strongly linked to CBD employment. Interestingly, this chart shows that additional journeys involving trams come from all parts of Melbourne. I would suggest this would be a combination of people living in the inner city and suburbs using nearby trams to get to jobs in the inner city, as well as people using trains from all parts of the city and transferring onto trams for the final leg to work. Melbourne’s multi-modal time-based ticketing removes any cost barrier from making such transfers – something still largely lacking in Sydney (is this a reason why there has been less mode shift in Sydney?). 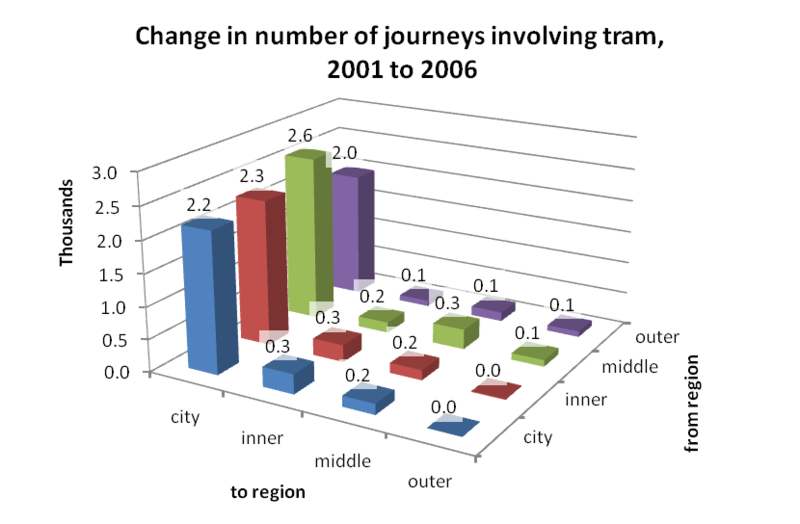 You can also see an increase in train and tram usage for trips wholly within the inner city – despite the mode shift away from public transport in the inner city. 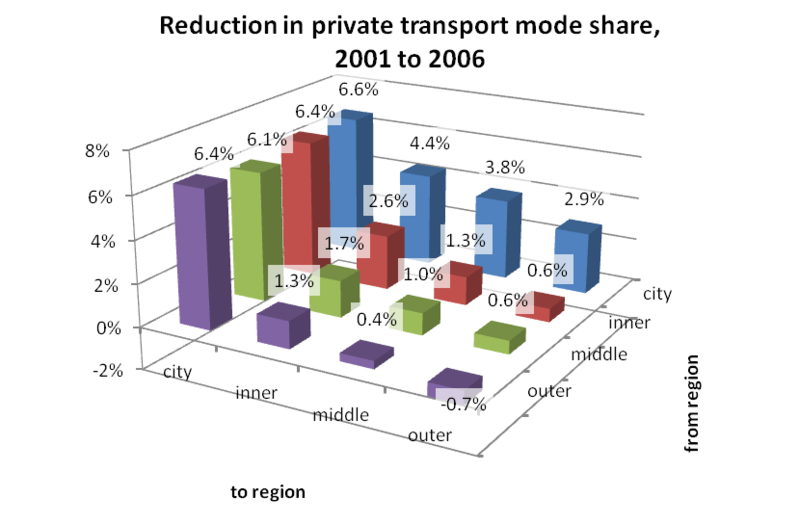 This suggests the growth in public transport use from the inner city is being swamped by the growth in people walking and cycling to work (refer to charts on private car mode share below). These generally small figures probably reflect the growth in population in the outer suburbs, more than anything else. 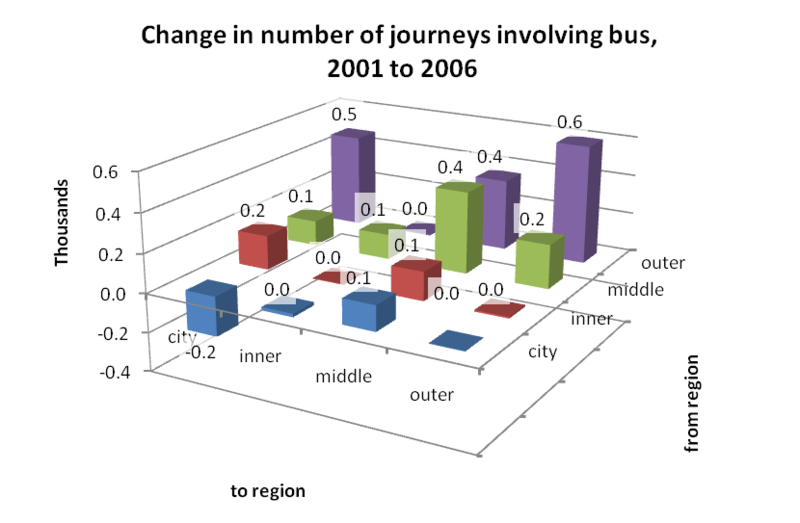 However there is a notable increase in the use of buses by outer suburban commuters for trips to the inner city – suggesting more use of buses to access train stations (as very few outer suburban buses travel to the inner city). Buses primarily serve the middle and outer suburbs of Melbourne, but they do aim to feed the train network. These figures suggest just 500 of the 7400 additional commuters from the outer suburbs to the inner city got to the station by bus. The average AM peak bus headway in the outer suburbs of Melbourne is over 40 minutes – which probably explains why new train users are not using buses to get to the station! But curiously the data also shows only around 560 extra trips using both public and private transport to travel from the outer suburbs to the inner city, suggesting the other 6900 new commuters walked to stations in the outer suburbs. Perhaps this reflects full car parks at train stations. This chart might suggest that people from the outer suburbs might be stealing parking places from those in the middle suburbs. However, there is an overall decline of around 1076 in people using private and public transport for journeys to work. As car parks are notorious for being full early on weekdays, this might suggest that the car parks are being used by journeys to places other than work. For reference, the following chart shows who is using both private and public transport (mostly park and ride, but also car passengers who also used PT (kiss and ride)). I understand there are around 30,000 car parking spaces at Melbourne train stations, and the journey to work data shows around 23,500 car + train journeys to work. In a future post I plan to look at concentrations of combinations of modes in journeys to work. The results are quite interesting if you know local conditions around Melbourne. Along the same lines as above, the next charts shows mode shift towards active transport. I have considered a trip active transport if it involves a bicycle, or if it only involves walking. No surprises that active transport trips are generally within the same ring (short trips), and active transport has a higher mode share closer to the city (better cycling facilities and closer origins and destinations). Growth in the number of active transport trips in the outer suburbs probably reflects population growth as much as anything. Not surprisingly, the growth is primarily from the inner city and suburbs to the inner city (which has been a major focus on bicycle infrastructure investment). 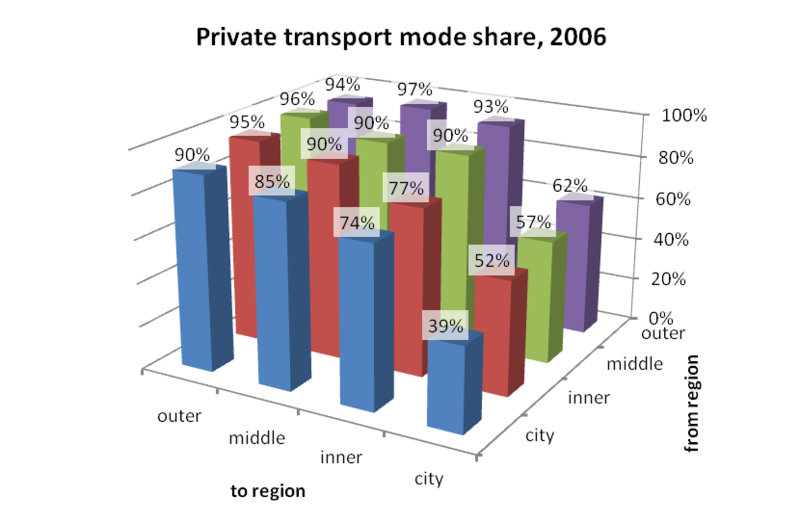 No surprises that private transport has the highest mode share for trips between the middle and outer suburbs, and the lowest mode share for trips to the inner city. The greatest asymmetry involves trips to and from the inner city. Private transport has a higher mode share for trips from the inner city to the inner suburbs than vice-versa, despite counter-peak public transport service levels still being reasonably good in the AM peak. I’d suggest this probably largely reflects the relative ease of parking in the inner suburbs compared to the inner city, although outbound traffic congestion would also be slightly lower. Again, the biggest mode shifts have been on trips to the inner city (and on the small number of outbound trips from the inner city), and higher closer to the city. There has actually been a mode shift towards private transport in the outer suburbs, which are generally poorly served by public transport, walking and cycling infrastructure. In particular, new suburbs often don’t receive any public transport until well after most residents have moved in. The above chart also represents the mode shift towards ‘sustainable’ transport modes (walking, cycling and public transport). It shows a more consistent pattern than the mode shift towards public transport. It appears that there is a consistent mode shift to sustainable modes for trips to the inner city, but those originating from the inner city and suburbs are more likely to be a shift to active transport. Or perhaps simultaneous shifts from private to public transport and public to active transport. According to the data, there were 6 (yes, just six) less private transport trips within the inner city (although this number is certainly not precise due to ABS’s randomisation introduced to protect privacy). 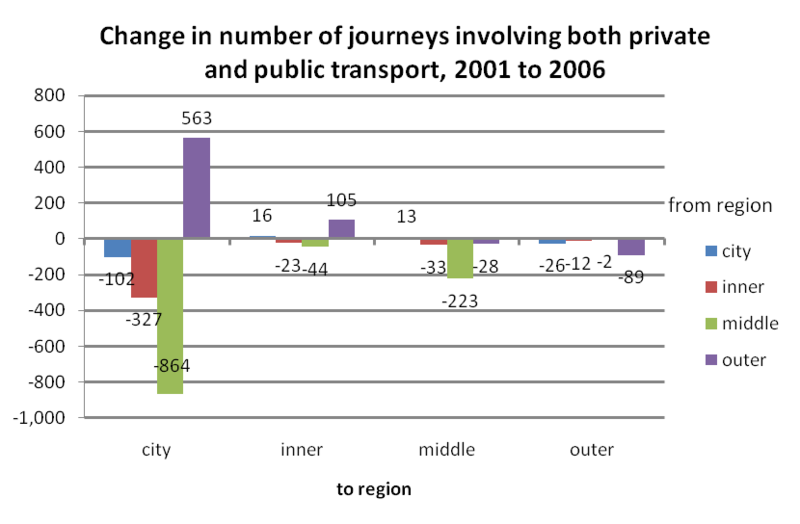 There was a net decline in the number of private transport trips from the inner and middle suburbs to the inner city. There were almost 11,000 additional private transport trips from the outer suburbs to the inner city. These create maximum congestion and probably reflect the low public transport service levels in the outer suburbs, and the lack of jobs in the outer suburbs for the new residents. The 100,000 additional private transport trips from the outer suburbs largely reflects the large population growth. This is entirely consistent with the trends of traffic volume’s on Melbourne’s roads, which show stagnation of inner metropolitan traffic volumes. Further evidence that mode shift to public transport is preventing congestion from getting a lot worse. 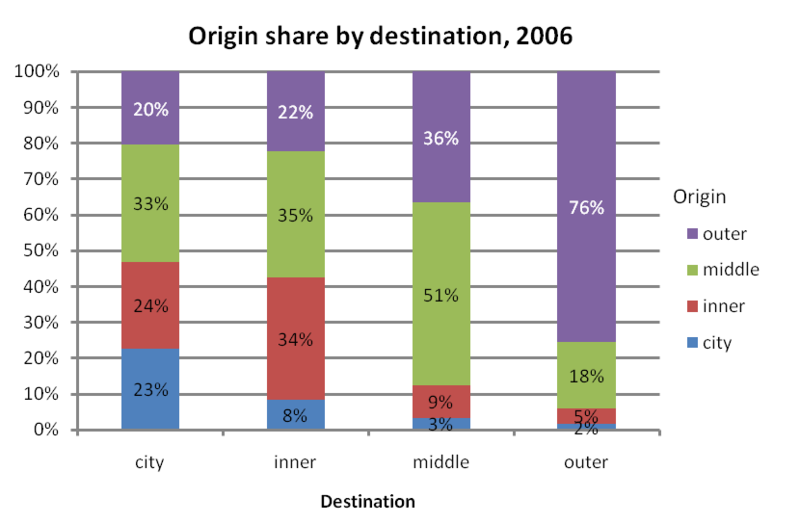 The following chart looks at the mode share of the absolute increase in journeys from each region. It essentially assumes that the existing population haven’t changed modes, but the new residents have chosen a different set of modes, which of course is very unlikely to be the case. 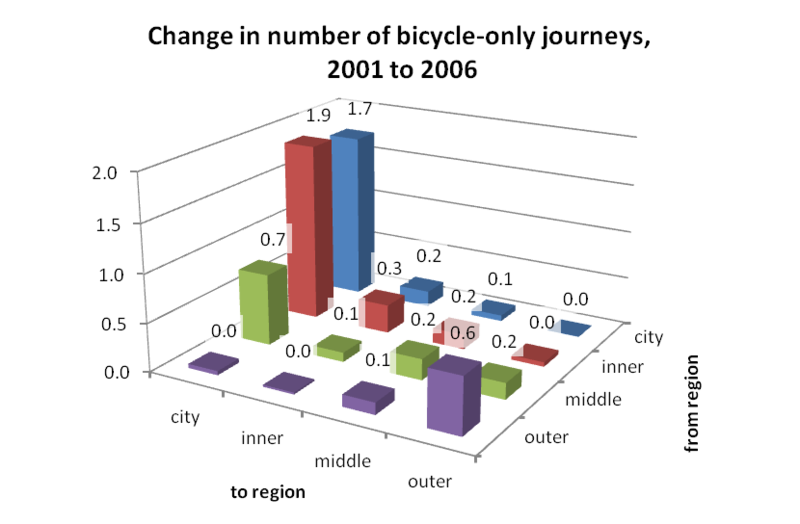 But it does show the share of the growth in trips for region – for example, for every 100 new trips in the inner suburbs, only 20% of them were by private transport. 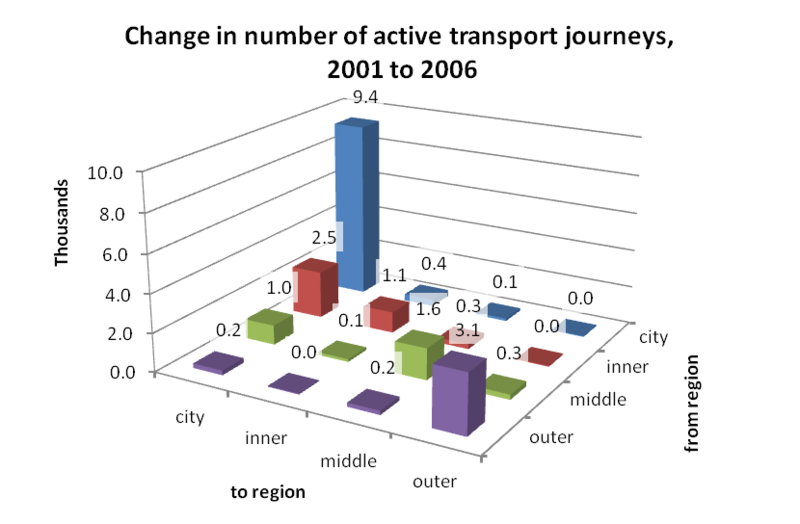 It shows that growth in active transport trips has dominated the inner city, while growth in public transport trips has dominated the inner and middle suburbs. 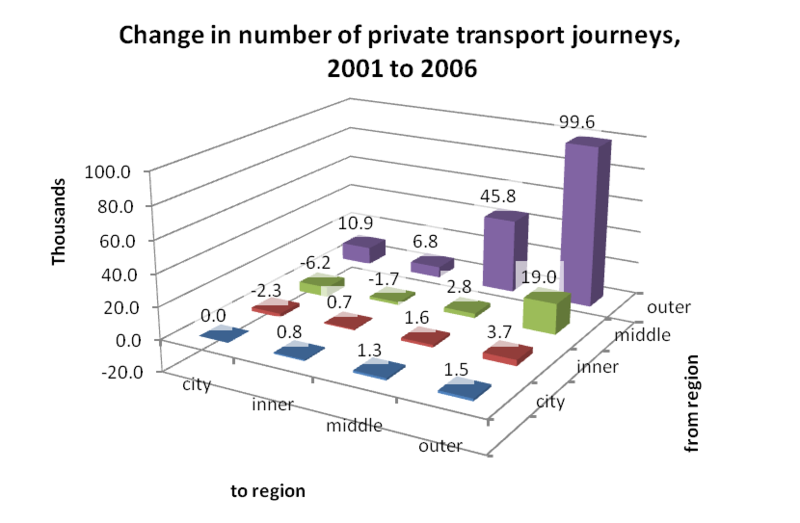 Meanwhile, private transport has dominated the growth in trips in the outer suburbs. This is a very worrying statistic given half of Melbourne’s urban growth is in the outer suburbs. I plan to make another post soon looking at the spatial distribution of mode use in journey to work. Stay tuned. This entry was posted on Sunday, June 20th, 2010 at 6:09 pm and is filed under Melbourne, Mode share, Mode shift. You can follow any responses to this entry through the RSS 2.0 feed. You can leave a response, or trackback from your own site.